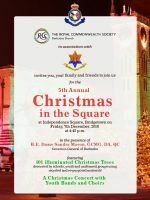 The Royal Commonwealth Society (RCS) Barbados Branch presents Christmas in the Square. 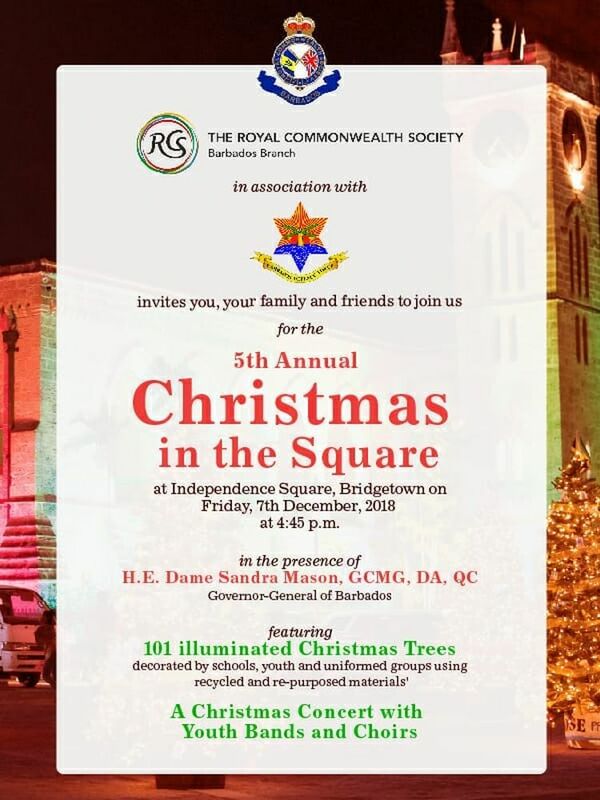 There will be one hundred and twenty (120) 10-foot Christmas trees in the square, set up by the Barbados Defence Force. Each tree represents a country of the Commonwealth. The trees are decorated by students of primary and secondary schools, members of youth organisations and the Royal Commonwealth Society (RCS) Barbados Branch and topped by the flag of the Commonwealth country each depicts. This year, trees will also be set up in Heroes Square, Jubilee Gardens, the Grantley Adams International Airport as well as Government House and the General Post Office, Cheapside. On Opening Night, Dec 7th, at 4:45 pm, there will be a free community concert featuring Youth Bands and Choirs in Independence Square. The event will be held in the presence of the Governor General H.E. Dame Sandra Mason, GCMG, DA, QC.